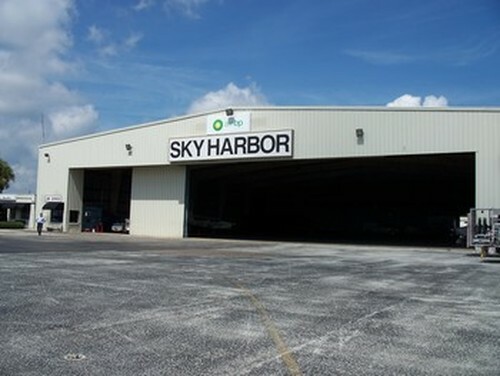 Sky Harbor Aviation -- your Jacksonville FBO for convenience, full-service and those important extras that make a difference to crew and passengers. Both for locally-based and transient aircraft, Sky Harbor offers a full range of aircraft and crew services. Convenience: CRG is the closest field to downtown -- only 10 minutes away. An easy drive to anywhere in the metro area. It’s also the closest field to Alltel Stadium. -- a quick 15 minutes away. Hungry passengers? We even offer gourmet catering. Full-Service FBO: Fuel discounts, self-serve fuel 24/7, WSI Pilotbrief II computerized weather, and overnight hangar space are waiting for you at Sky Harbor. Plus an FAA certified repair station and a full-service avionics facility are right here. Special Crew Services: From courtesy cars and Hertz rental cars to discounts at local hotels and restaurants, Sky Harbor pays attention to crew comfort too, as well as aircraft services. A relaxing pilot lounge and a peaceful snooze room are at the ready. And of course big screen TV and high speed wireless internet are part of Sky Harbor’s services. Count on Sky Harbor personnel greeting you with a big welcome. Hangar Space for Transient Aircraft, One night FREE! with 250 gallon fuel purchase. Call us at (904) 641-8555 to have a HERTZ Rental Car delivered right to your aircraft. We know you need more than just fuel at your preferred FBOs. Sky Harbor provides that -- and more.